As healthcare evolves, pathologists play a critical role on multidisciplinary teams in the delivery of patient-centered care. See, Test & Treat embodies this leadership as pathologists care for and communicate with their patients. Every See, Test & Treat program begins with a pathologist who recognizes the need in his or her community, champions the program, and rallies a host of partners to deliver patient care. In a single-day, culturally appropriate program, women receive a pelvic and clinical breast exam, a Pap test with same-day results, a screening mammogram with same-day or prompt results, connection to follow-up care, interpretive services, translated educational materials, and a healthy meal. Same-day results remove obstacles that keep many women from following through on preventive care. For a woman who works two jobs, has an inflexible schedule, and limited options for childcare or transportation, getting back to the hospital or clinic for a second visit to receive test results can be a challenge. This is in addition to other health services that respond to the unique needs of its community. Every woman who shows up for screenings can spend the whole day learning how to take charge of her own health and well-being. This unique dialogue turns the scariest part of health care—waiting for results from a potentially life-changing test—into one that is most welcoming, supportive, and educational. Through See, Test & Treat, women better understand their own health care and how to ask their providers questions. 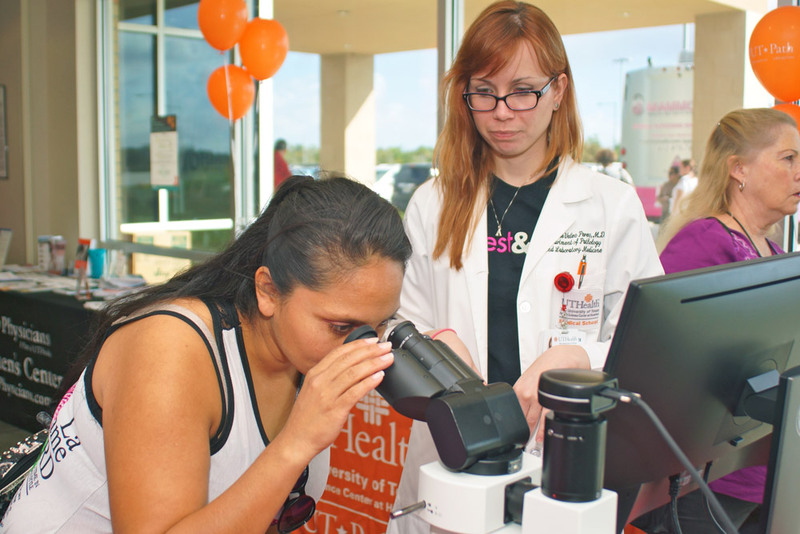 Participants get the chance to see what healthy cells and cancer cells look like (often using a dual-view microscope or digital camera), learn what the pathologist is looking for in a screening, and understand the major contributors to cervical cancer risk. Every See, Test & Treat takes place in a hospital or clinic that has agreed to create an electronic medical record for each woman and commits to ensure follow-up care for all women who participate. Women with abnormal screening results schedule their next appointments on the same day. See, Test & Treat programs are typically a one-day, yearly event, often held on a Saturday. Programs are large enough to deliver real impact and efficiency, yet small enough to ensure a high-quality, dignified experience. This one-day approach effectively addresses barriers encountered by uninsured women faced with health disparities; those who have little to no access to preventative care and also provides a medical home for the future. Interested in hosting a See, Test & Treat?